The two heads of state agreed to guide the direction of bilateral ties from a strategic height and long-term perspective. During their talks, Xi noted that both as countries with an ancient civilization, China and Italy have profound historical relations. This year marks the 15th anniversary of the China-Italy comprehensive strategic partnership, and the two countries will celebrate the 50th anniversary of their diplomatic relations next year, Xi said. He recalled that for nearly half a century, China and Italy have respected, trusted and helped each other, enhanced high-level exchanges and strategic mutual trust, facilitated communication, cooperation and convergence of interests, and deepened mutual understanding and traditional friendship. As the world is undergoing profound changes unseen in a century, China is willing to carry forward the spirit of cooperation with the Italian side, strengthen strategic communication, encourage the international community to seek common ground while reserving differences and promote development through cooperation, so as to contribute new wisdom and strength to building a better world, Xi said. China stands ready to join hands with Italy to firmly keep the direction of bilateral relations in the new era, carry out closer high-level exchanges and upgrade the quality and level of bilateral practical cooperation, he said. 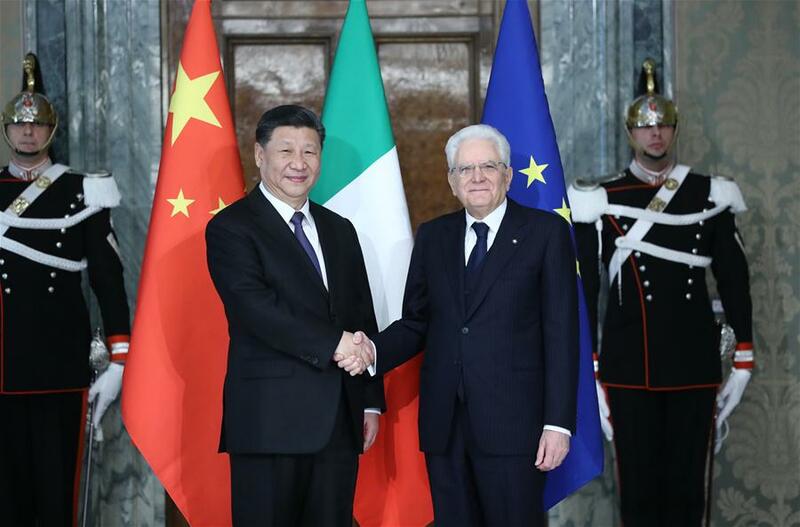 Xi said he agrees with Mattarella that Italy and China should be partners with inclusive interests and common development, adding that China is willing to enhance the comprehensive strategic partnership with Italy. The two sides need to strengthen communication on visions, consolidate political mutual trust, continue to extend mutual understanding and support on issues of each other's core interests and major concerns, and strengthen communication and cooperation between their governments, legislative bodies and political parties, Xi said. He encouraged the two sides to create highlights in bilateral cooperation, jointly build the Belt and Road, and promote the synergy of their development strategies and the planning of practical cooperation. China is willing to import more high-quality products from Italy and encourage more capable Chinese enterprises to invest and start business in Italy, Xi said. He also urged the two countries to boost cultural and people-to-people exchanges, and enhance communication and cooperation in such fields as culture, education, film and television, and media, so as to consolidate the popular support for friendship between the two peoples. On China-Europe relations, Xi said his country has always supported the European integration and respected the European Union's efforts in solving its problems. Xi said he hopes that Italy will continue playing a positive role in promoting EU-China partnership for peace, growth, reform and civilization, Xi said. China is willing to strengthen communication and coordination with the Italian side on major issues such as the United Nations affairs, global governance, climate change and the 2030 Agenda for Sustainable Development, jointly promote trade and investment liberalization and facilitation, and jointly push economic globalization in the direction of becoming more open, inclusive, balanced, win-win, and beneficial to all, he said. Mattarella warmly welcomed Xi, saying he still has a vivid memory of his visit to China in 2017. The frequent high-level exchanges between Italy and China, especially President Xi's visit this time, demonstrated the high level of bilateral relations, Mattarella said, calling China a close and important partner of Italy. Italy admires China's development achievements, appreciates China's adherence to the opening-up strategy, and has confidence in the prospect of Italy-China cooperation, he said. Italy is willing to take the opportunities of the 15th anniversary of the Italy-China comprehensive strategic partnership this year and the 50th anniversary of Italy-China diplomatic relations next year to expand the mutually beneficial cooperation in various fields such as economy and trade, investment, science and technology, and innovation between the two countries, Mattarella said. Italy and China were at the two ends of the ancient Silk Road which had been a bond closely linking the two countries, Mattarella said. Italy supports Xi's initiative on jointly building the Belt and Road and believes that it will be conducive to Eurasian connectivity and common development, as well as to reviving the ancient Silk Road in modern times, Mattarella said. Calling the Belt and Road a cultural exchange road, the Italian president said his country is willing to boost communication and cooperation with China in culture and tourism. Both as countries with an ancient civilization, Mattarella said the peoples of Italy and China have wisdom to address the challenges facing human society today. Italy believes that China's rejuvenation will make new historic contributions to the world's peace and prosperity, he said, adding that Italy is committed to promoting in-depth development of EU-China ties. Italy is willing to enhance communication and coordination with China in multilateral institutions such as the UN and the Group of Twenty, jointly safeguard multilateralism and trade liberalization, and meet challenges such as climate change and international security together, Mattarella said. The two presidents held a joint press conference after the talks. Before their talks, the Italian president held a grand welcoming ceremony for Xi. The Chinese president arrived in Rome Thursday for a state visit to Italy, the first stop of his three-nation Europe tour, which will also take him to Monaco and France.